Visualizations bring your data to life, and reveal insights that only compelling and amazing visual representations can. 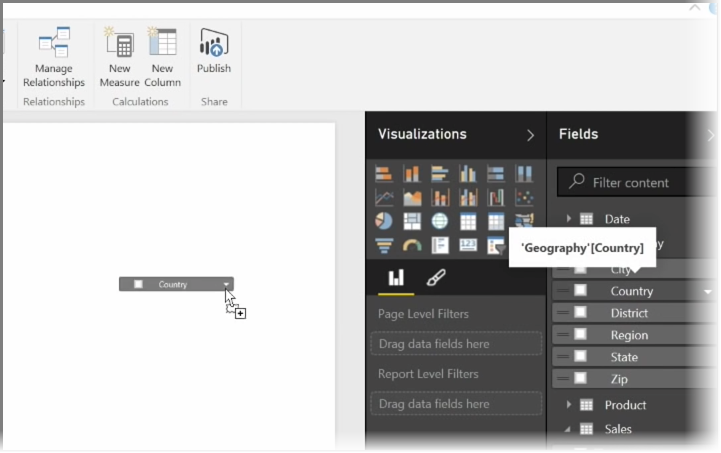 This section of Power BI Guided Learning shows you how to get started using them. 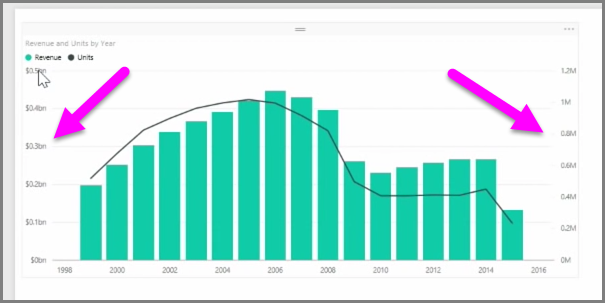 Welcome to the Visualizations section of the Guided Learning course for Power BI. 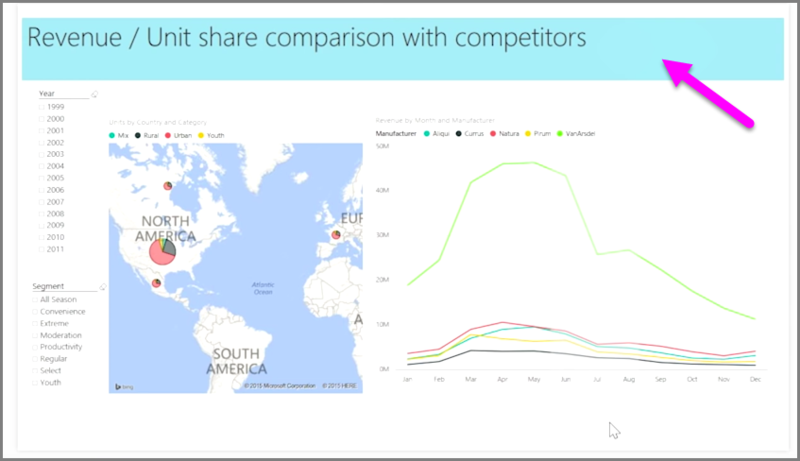 Get ready for a fun, interesting, and enlightening tour of the many, many visualizations Power BI has to offer. And this isn't all of them - there are more visualizations coming all the time! Of course, visuals are the end-result of any business intelligence undertaking... we want to take data, present it in a compelling and insightful way, and show what stands out. 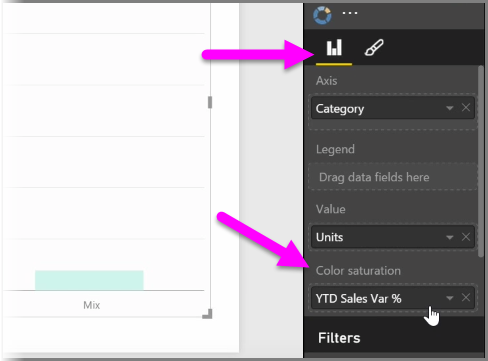 And Power BI has all sorts of compelling visuals - and a nearly limitless way to customize them - so this is an important section! It might seem like there are lots of topics in this section, but don't worry: each topic is short, filled with (you guessed it) visuals, and easy to absorb. You'll likely find yourself cruising through this section, and imagining how you'll make these visuals present your own data. We'll start with the mainstays of visualizations - the simple visuals we're all familiar with - and make sure you know the ins and outs. Then we'll get more advanced, or at least a little less common, and fill up your report-creating toolbox. Have fun - there's a lot to learn here! 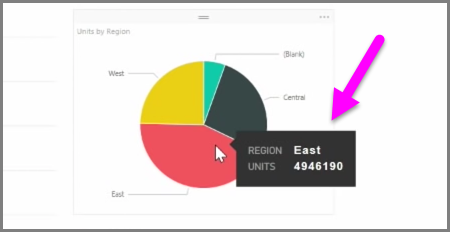 Visualizing data is one of the core parts of Power BI - a basic building block as we defined it earlier in this course - and creating visuals is the easiest way to find and share your insights. 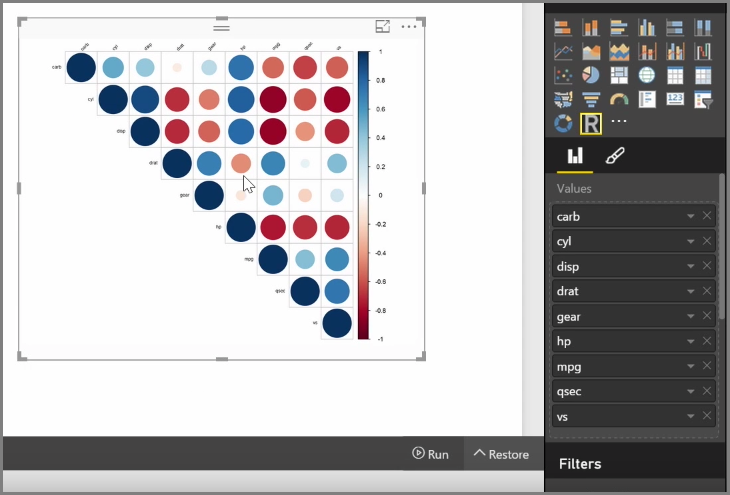 Power BI has a whole range of visualizations available by default, from simple bar charts to pie charts to maps, and even more esoteric offerings like waterfalls, funnels, gauges, and more. 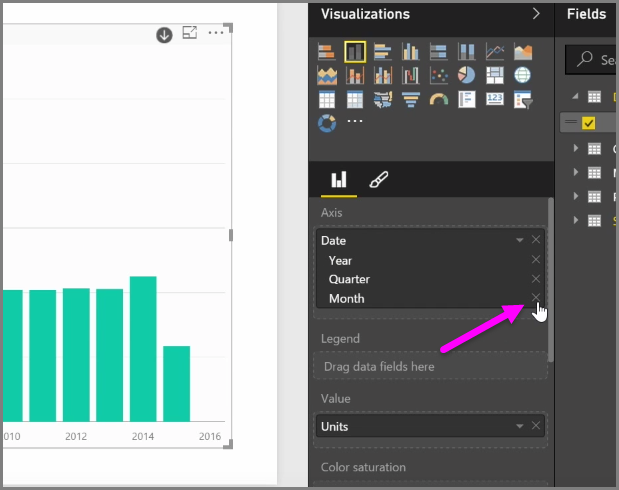 Power BI Desktop also offers extensive page formatting tools, such as shapes and images, that help bring your report to life. In this article you learn how to create new bar charts, pie charts, and treemaps, and customize them to suit your reports. You can drag field names from the Fields pane, and drop them on the report canvas. By default your visualization appears as a table of data. You can also click the type of visualization you want to create in the Visualizations pane. With this method, the default visual is a blank placeholder that resembles the type of visual you selected. Once you create your graph, map, or chart, you can begin dragging data fields onto the bottom portion of the Visualization pane to build and organize your visual. The available fields will change based on the type of visualization that you selected. As you drag and drop data fields, your visualization will automatically update to reflect changes. You can resize your visualization by selecting it and then dragging the handles in or out. You can also move your visualization anywhere on the canvas by clicking and then dragging it. If you want to convert between different types of visualizations, select the visual you want to change and simply select a different visual from the icons in the Visualization pane. 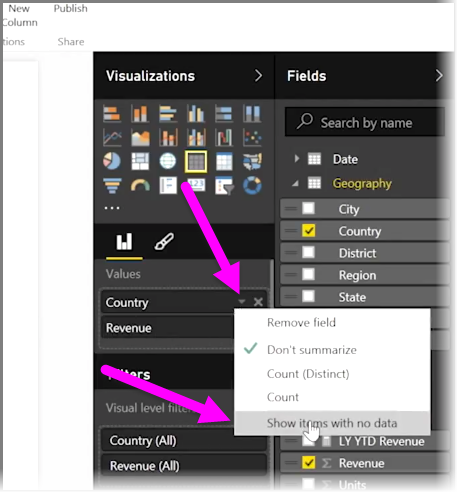 Power BI attempts to convert your selected fields to the new visual type as closely as possible. As you hover over parts of your visualizations, you'll get a tooltip that contains details about that segment, such as labels and total value. Select the paintbrush icon on the Visualizations pane to make cosmetic changes to your visual, such as background alignment, title text, and data colors. The available options for cosmetic changes to your visual vary depending on the type of visual you have selected. When you want to visualize two measures that have very different scales, such as revenue and units, a combination chart that shows a line and a bar with different axis scales is very useful. 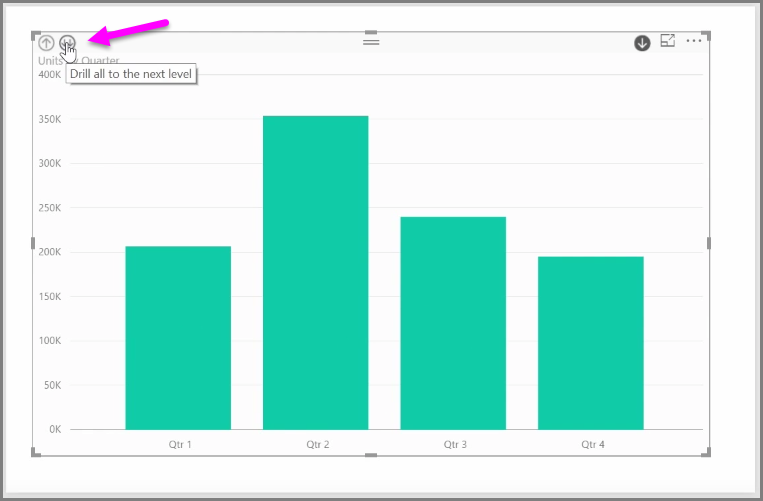 Power BI supports many different types of combination charts by default, including the popular Line and Stacked Columns charts. When you create a combination chart, you're presented with a field for Shared Axis (the X-axis), and then values for your two fields, in this case a column and a line. The two Y-axis legends appear on either side of the visualization. You can also split each column by category, by dragging a category into the Column Series field in the Visualizations pane. When you do so, each bar is proportionately colored based on the values within each category. Combination charts are an effective way to visualize multiple measures that have very different scales in a single visualization. Slicers are one of the most powerful types of visualizations, particularly as part of a busy report. 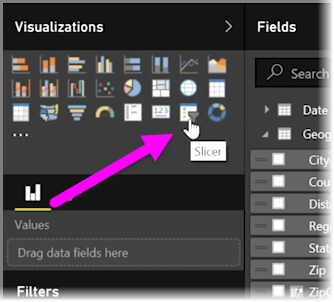 A slicer is an on-canvas visual filter in Power BI Desktop that lets anyone looking at a report segment the data by a particular value, such as by year or by geographical location. To add a slicer to your report, select Slicer from the Visualizations pane. Drag the field by which you want to slice and drop it top of the slicer placeholder. The visualization turns into a list of elements with checkboxes. These elements are your filters - select the box next to one to segment, and all other visualizations on the same report page are filtered, or sliced, by your selection. There are a few different options available to format your slicer. You can set it to accept multiple inputs at once, or toggle Single Select mode to use one at a time. You can also add a Select All option to your slicer elements, which is helpful when you have a particularly long list. Change the orientation of your slicer from the vertical default to horizontal, and it becomes a selection bar rather than a checklist. 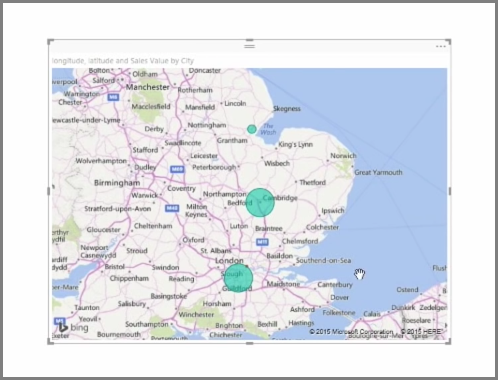 Power BI has two different types of map visualizations: a bubble map that places a bubble over a geographic point, and a shape map that actually shows the outline of area you want to visualize. When working with countries or regions, use the three-letter abbreviation to ensure that geocoding works properly in map visualizations. Do not use two-letter abbreviations, as some countries or regions may not be properly recognized. If you only have two-letter abbreviations, check out this external blog post for steps on how to associate your two-letter country/region abbreviations with three-letter country/region abbreviations. 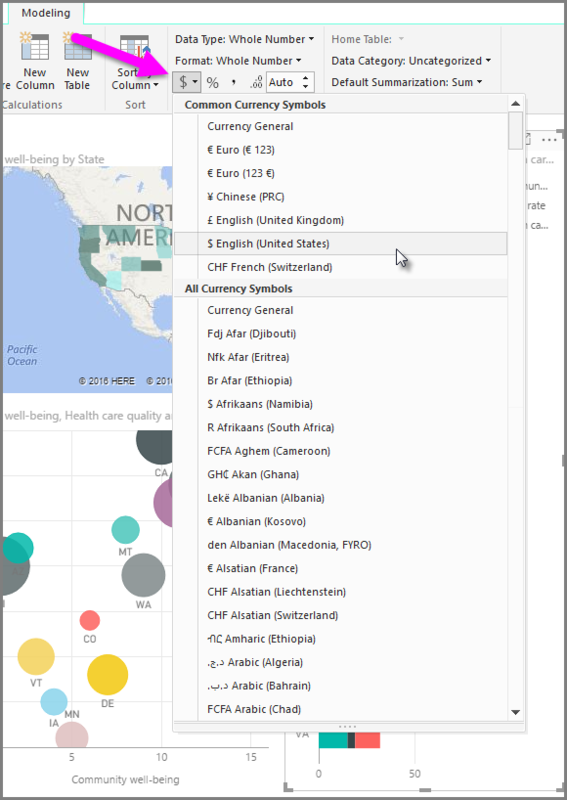 To create a bubble map, select the Map option in the Visualization pane. You must add a value to the Location bucket in the Visualizations options to use a map visual. Power BI is flexible about what type of location value it accepts, from more general details like city name or airport code, down to very specific latitude and longitude data. Add a field to the Size bucket to change the size of the bubble accordingly for each map location. To create a shape map, select the Filled Map option in the Visualization pane. As with bubble maps, you must add some kind of value to the Location bucket to use this visual. Add a field to the Size bucket to change the intensity of the fill color accordingly. A warning icon in the top left corner of your visual indicates that the map needs more location data to accurately plot values. This is a particularly common problem when the data in your location field is ambiguous, such as using an area name like Washington that could indicate a state or a district. One way to resolve this problem is to rename your column to be more specific, such as State. Another way to resolve it is to manually reset the data category by selecting Data Category in the Modeling tab. From there you can assign a category to your data such as "State" or "City". 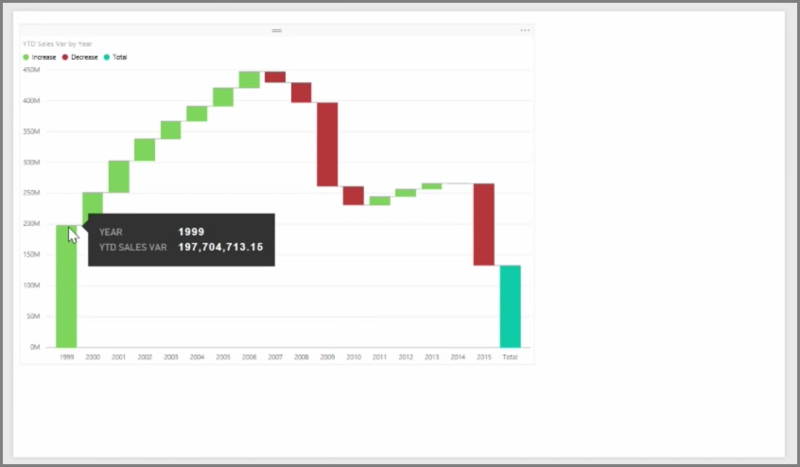 In addition to an abundance of charts, Power BI Desktop also supports more tabular visualizations. In fact, when you grab a categorical field or text field and drag it onto the report canvas, you get a table of results by default. You can scroll up and down through the table, and initially it will be sorted alphabetically. If you have numerical information in a table, such as revenue, a total sum will appear at the bottom. You can manually sort by each column by clicking on its header to toggle ascending or descending order. If a column is not wide enough to display all of its contents, click and drag the header sideways to expand it. The order of the fields in the Values bucket in the Visualizations pane determines the order in which they appear in your table. A matrix is similar to a table, but it has different category headers on the columns and rows. As with tables, numerical information will be automatically totaled along the bottom and right side of the matrix. There are many cosmetic options available for matrixes, such as auto-sizing columns, toggling row and column totals, setting colors, and more. When creating a matrix, make sure your categorical data (the non-number data) is on the left of the matrix, and the numeric files on the right to ensure the horizontal scroll bar appears, and to make sure that scrolling behavior works properly. If you want to compare two different measures, such as unit sales verses revenue, a common visualization to use is a scatter chart. To create a blank chart, select Scatter chart from the Visualizations pane. Drag and drop the two fields you want to compare from the Fields pane to the X Axis and Y Axis options buckets. 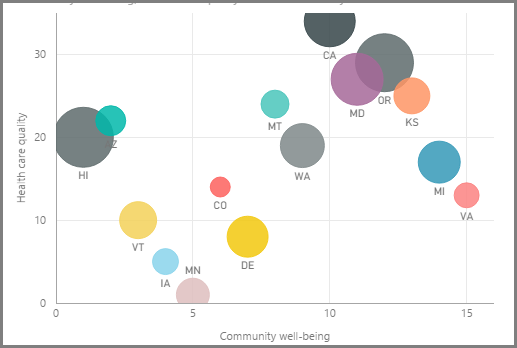 At this point, your scatter chart probably just has a small bubble in the center of the visual - you need to add a measure to the Details bucket to indicate how you would like to segment your data. For example, if are comparing item sales and revenue, perhaps you want to split the data by category, or manufacturer, or month of sale. Adding an additional field to the Legend bucket color-codes your bubbles according to the field's value. You can also add a field to the Size bucket to alter the bubble size according to that value. Scatter charts have many visual formatting options as well, such as turning on an outline for each colored bubble and toggling individual labels. You can change the data colors for other chart types, as well. You can create an animation of your bubble chart's changes over time by adding a time-based field to the Play Axis bucket. Click on a bubble during an animation to see a trace of its path. Remember, if you only see one bubble in your scatter chart, it's because Power BI is aggregating your data, which is the default behavior. Add a category to the Details bucket, in the Visualizations pane, to get more bubbles. 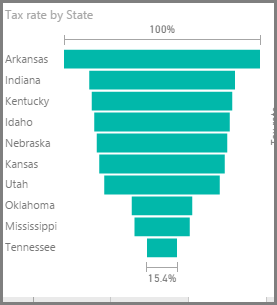 Waterfall and funnel charts are two of the more interesting (and perhaps uncommon) standard visualizations that are included in Power BI. To create a blank chart of either type, select its icon from the Visualizations pane. Waterfall charts are typically used to show changes in a particular value over time. Waterfalls only have two bucket options: Category and Y Axis. Drag a time-based field such as year to the Category bucket, and the value you want to track to the Y Axis bucket. Time periods where there was an increase in value are displayed in green by default, while periods with a decrease in value are displayed in red. Funnel charts are typically used to show changes over a particular process, such as a sales pipeline or website retention efforts. Both Waterfall and Funnel charts can be sliced and visually customized. Generally, visualizations are used to compare two or more different values. However, sometimes when building reports you may want to track a just single Key Performance Indicator (KPI) or metric over time. 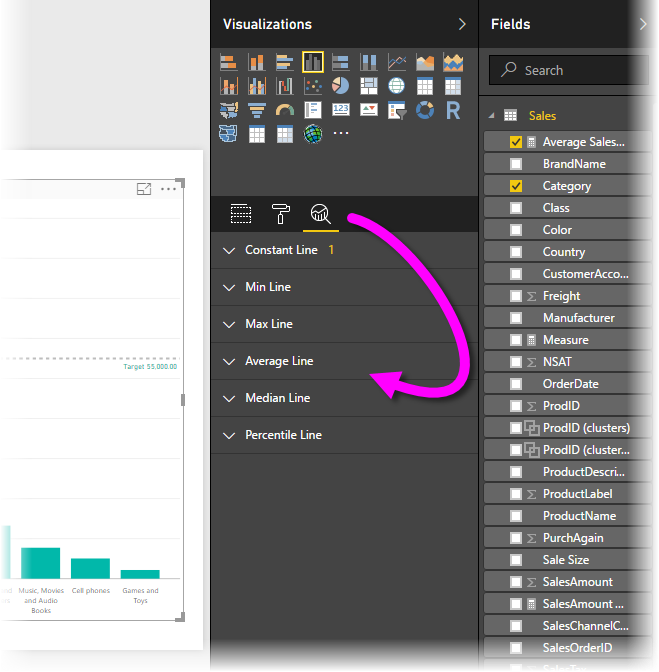 The way to do this in Power BI Desktop is with a Gauge or single number card visual. To create a blank chart of either type, select its icon from the Visualizations pane. Gauges are particularly useful when you are building dashboards and want to show progress towards a particular target. To create a gauge, select its icon from the Visualizations pane, and drag the field you want to track into the Value bucket. Gauges appear by default at 50%, or double the Value, and there are two ways to adjust this setting. To dynamically set the values, drag fields to the Minimum, Maximum, and Target Value buckets. Alternatively, use the visual formatting options to manually customize the range of your gauge. Card visualizations simply show a numeric representation of a field. 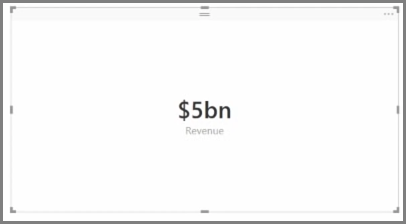 By default card visuals use display units to keep the number short, for example displaying "$5bn" instead of "$5,000,000,000". Use the visual formatting options to change the unit being used, or disable it completely. One interesting application of cards is to have them display a custom measure that you've concatenated with text. To use the earlier example, with a custom measure your card could include advanced DAX functions and display something like, "Total revenue this year: $5bn" or "Progress on unit sales this year:" and then add the number that represents the progress. 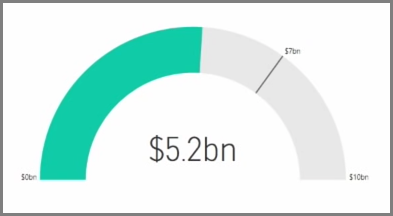 There are many times when you might want to modify the colors used in charts or visuals. 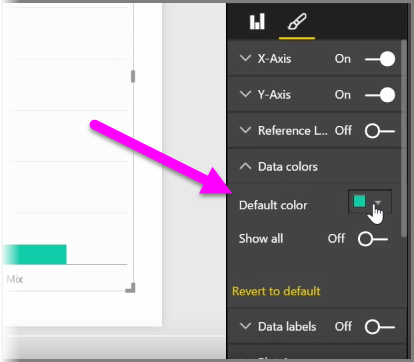 Power BI gives you lots of control over how colors are displayed. 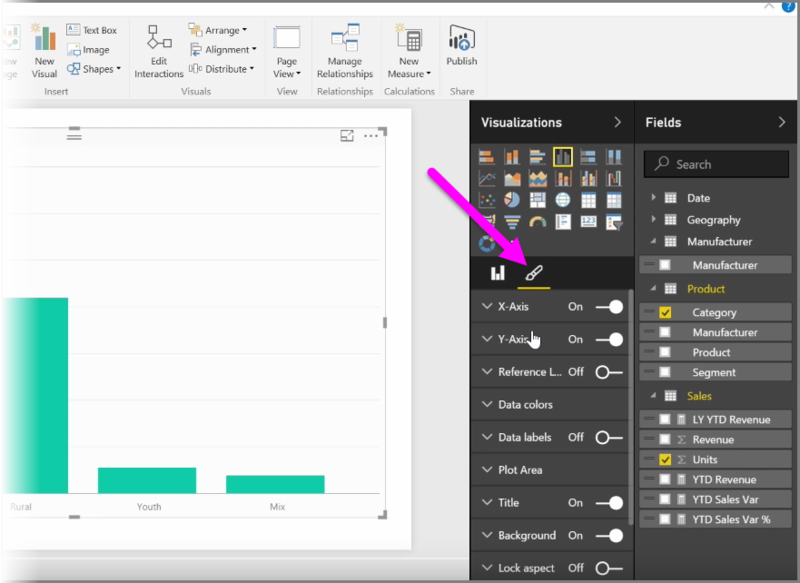 To get started, select a visual then in the Visualizations pane, click the paintbrush icon. There are many options for changing the colors or formatting of the visual. You can change the color of all bars of a visual by selecting the color picker beside Default color, then selecting your color of choice. You can also change the color of each bar (or other element, depending on the type of visual you selected) by toggling the Show all slider to on. When you do, a color selector appears for each element. You can also change the color based on a value, or measure. To do so, drag a field into the Color saturation bucket in the Visualizations pane (note that this is available in the field well section, not the paintbrush section). In addition, you can change the scale and the colors that are used when filling data element colors. You can also select a diverging scale by toggling the Diverging slider to on, which lets the color scale between three colors. And you can also set Minimum, Center, and Maximum values displayed on your chart. You can also use those values to create rules, for example, to set values above zero a certain color, and values below to another color. Another handy tool for using colors is setting a constant line, also sometimes referred to as a reference line. You can set the value of the constant line, set its color, and even have the reference line contain a label. To create a constant line (and other interesting lines), select the Analytics pane (looks like a magnifying glass) then expand the Reference Line section. There are many other lines you can create for a visual, also found in the Analytics pane, such as Min, Max, Average, Median, and Percentile lines. Lastly, you can create a border around an individual visualization, and like other controls, you can specify the color of that border as well. Along with data-bound visuals, you can also add static elements such as text boxes, images, and shapes to improve the visual design of your reports. To add a visual element, select Text Box, Image, or Shapes from the Home tab. Text boxes are an ideal way to display large titles, captions, or short paragraphs of information along with your visualizations. Text boxes can include links, either through a written URL or by highlighting an anchor phrase and selecting the link symbol on the text box options bar. 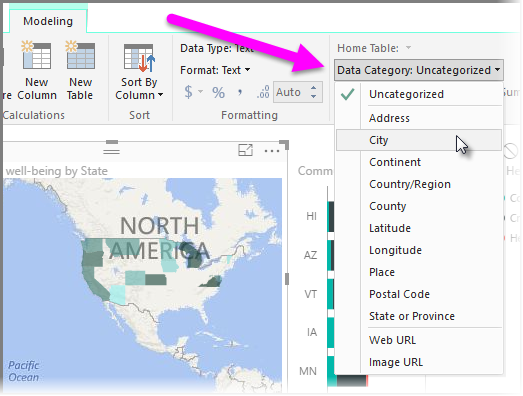 You can include URLs in text boxes, and Power BI automatically detects the link, and makes it live. Selecting Image will open a file browser where you can select the image from your computer or other networked source. By default, resizing an image in your report will maintain its aspect ratio, but this can be disabled in the visual formatting options. Power BI Desktop gives you the ability to control the layout and formatting of your report pages, such as size and orientation. Use the Page View menu from the Home tab to change the way your report pages scale. The available options include Fit To Page (default), Fit To Width, and Actual Size. You can also change the pages size itself. By default, report pages are 16:9. 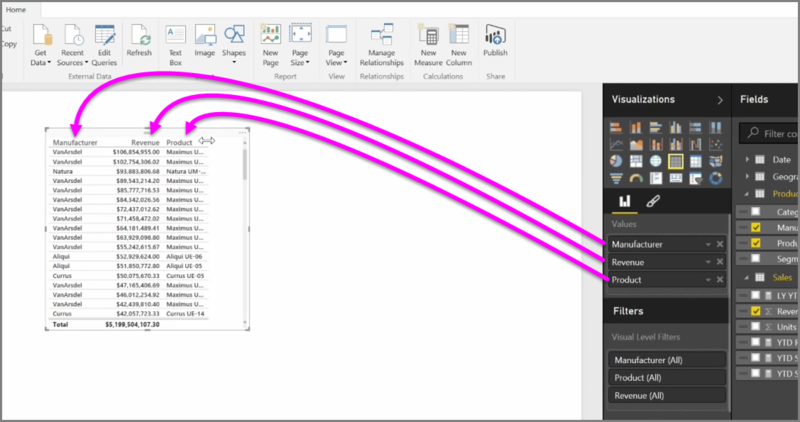 To change the page size, make sure no visuals are selected, then select the paintbrush icon in the Visualizations pane, then select Page Size to expand that section. Options for page size include 4x3 (more square aspect ratio), and Dynamic (the page will stretch to fill the available space). There's a standard letter size for reports as well. Keep in mind that you may need to resize your visuals after changing the page size to ensure that they're completely on the canvas. You can also specify a custom page size, setting the size by inches or pixels, and change the background color of the entire report. Another option is to select Cortana, which sizes the report so that it can be used as a result for searches using Cortana. When you have multiple visualizations on the same report page, selecting a particular segment by clicking or using a slicer will affect all the visuals on that page. In some cases, though, you may want to slice only specific visuals. This is particularly true when using elements such as scatter plots, where limiting the data to a specific segment will remove crucial meaning. 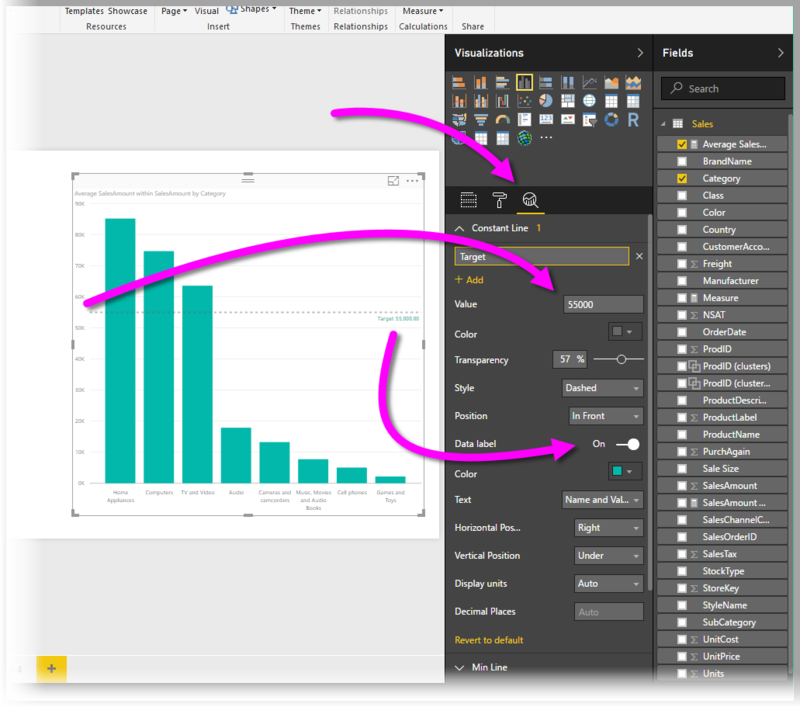 Fortunately, Power BI Desktop lets you control how interactions flow between visuals. To change the interaction between your visualizations, select Edit from the Visuals section of the Home ribbon to toggle Edit Mode on. 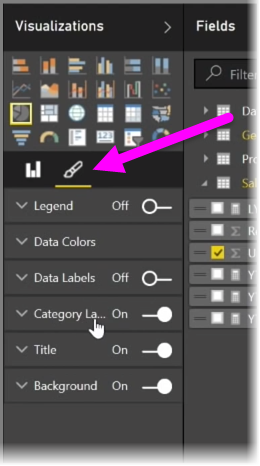 The Edit Interactions icon in Power BI Desktop has changed since the video was recorded. Now when you select a visual on your report canvas, you'll see a small opaque filter icon in the top right-hand corner of every other visual it will affect. To exclude a visual from the interaction, click the None symbol in the upper right corner, near the filter icon. In some instances you can adjust the type of filter interaction that happens between visuals. With Edit Mode toggled on, select the visual you use to filter. If you can change the type of interaction on another visual, a pie chart icon will appear next to the filter icon in the top right-hand corner. Click the pie chart icon to highlight the segmented data. Otherwise, the data will be filtered. As before, you can click the None icon to remove all interaction. A useful design tip is to draw a transparent shape around visuals that interact with each other, so it's clear to the user that they have an interactive relationship. Individual pages of a report can be quite complex, with multiple visualizations that interact in specific ways and have precise formatting. Occasionally when building a report, you may want to use the same visuals and layouts for two different page topics. For example, if you've just put together a report page on gross revenue, you may want an almost identical page on net revenue. Recreating all of your work would be difficult, but with Power BI Desktop you can just duplicate a report page. Right-click on the tab you want to copy, and select Duplicate Page. You can then rename the new page tab as appropriate, update the text title if you have one, and then update your visuals with the new field you want to track. By default, column headings are only displayed in your reports if they contain data. 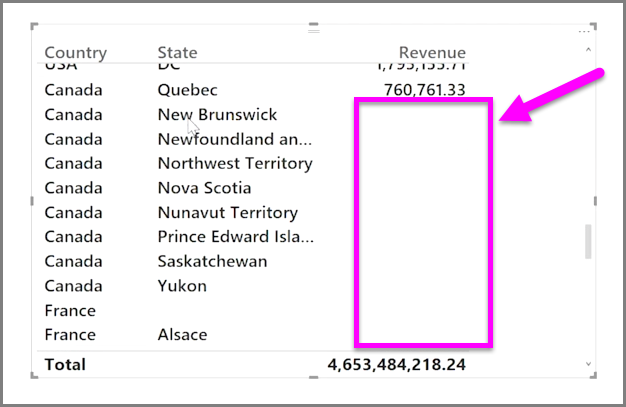 For example, if you were displaying revenue by country and had no sales in Norway, then Norway would not appear anywhere in your visualization. 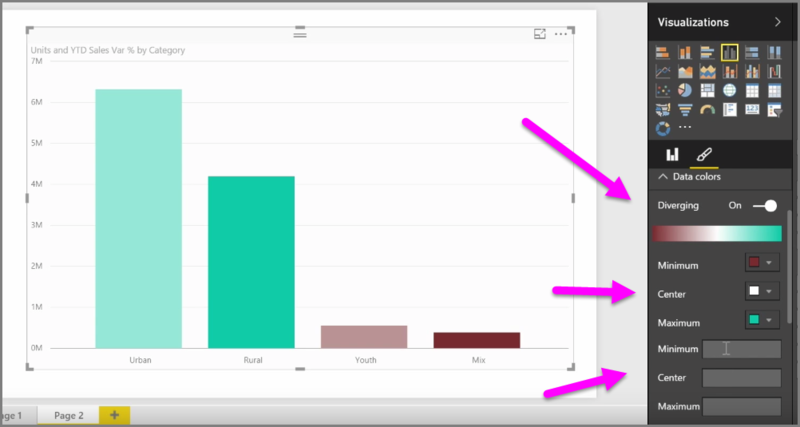 To display empty categories, click on the down-arrow in the field you want to change in the Visualizations pane, and select Show items with no data. Any empty columns now appear in your visual with blank values. Once you select Show items with no data for any field in the Visualizations pane, it applies to all fields displayed in the Visualizations pane. So if you add another field, any items that have no data will also be shown, without having to revisit the drop-down menu. 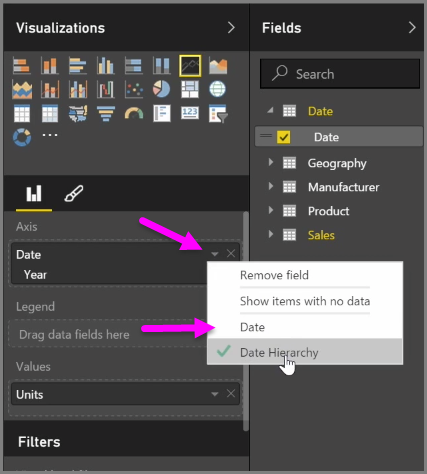 Power BI has properties that you can assign for fields in your model, which can help report and visualize and present data in ways that provide more clarity. For example, sometimes you want to average a list of numbers, but Power BI automatically sums the list. 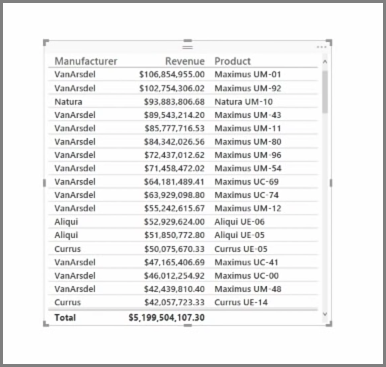 With Power BI, you can adjust how those lists of numbers are summarized. Let's take an example, and demonstrate how to control the way Power BI summarizes numeric data fields. Select a visual on your report canvas, and then select a field in the Fields pane. The Modeling tab appears in the ribbon and displays options for formatting data, and data properties. You can select the type of currency symbol used, by selecting the currency symbol drop down, which is shown in the following image. There are many different options for formatting fields. For example, you can change the format from currency to percentage. 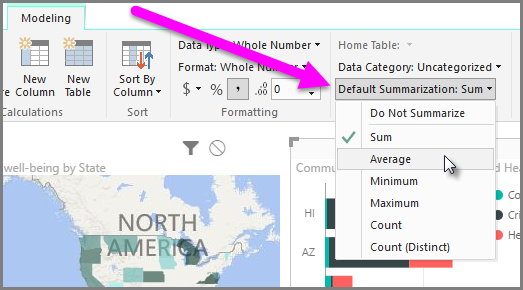 You can change how Power BI summarizes the data, too. Select the Default Summarization icon to change how a field is summarized, including displaying a sum, a count, or an average. You can make similar changes when plotting locations on a map. Select your map, and then select the field in the Fields pane that you use for the Location value. On the Modeling tab, select Data Category and then choose the category that represents your location data from the drop-down menu. For example, select state, county, or city. 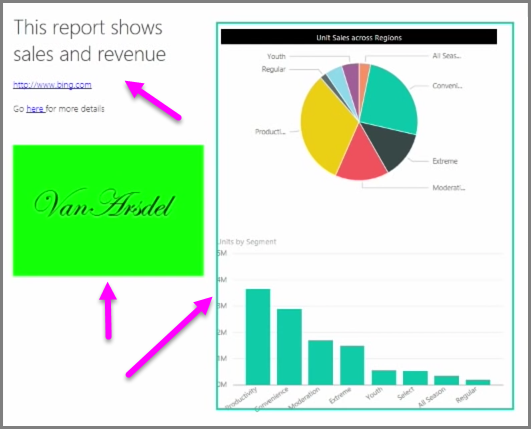 When you have lots of elements on a report, Power BI lets you manage how they overlap with each other. How items are layered, or arranged on top of one another, is often referred to as the z-order. To manage the z-order of elements in a report, select an element, and use the Arrange button on the Home tab of the ribbon to change its z-order. By using the options in the Arrange button menu, you can get the ordering of elements on your report just the way you want it. You can move a visual one layer forward or backward, or send it all the way to the front of the back of the order. Using the Arrange button is particularly useful when using shapes as decorative backgrounds or borders, or to highlight particular sections of an individual chart or graph. You can also use them to create a background, such as the following light-blue rectangle being used for a report title background. 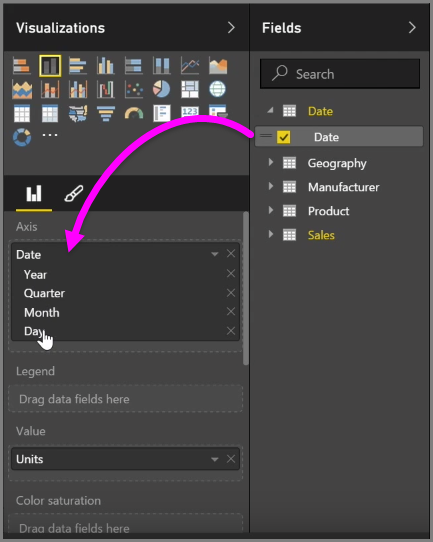 When you add a date field to a visual in the Axis field bucket, Power BI automatically adds a time hierarchy that includes Year, Quarter, Month and Day. 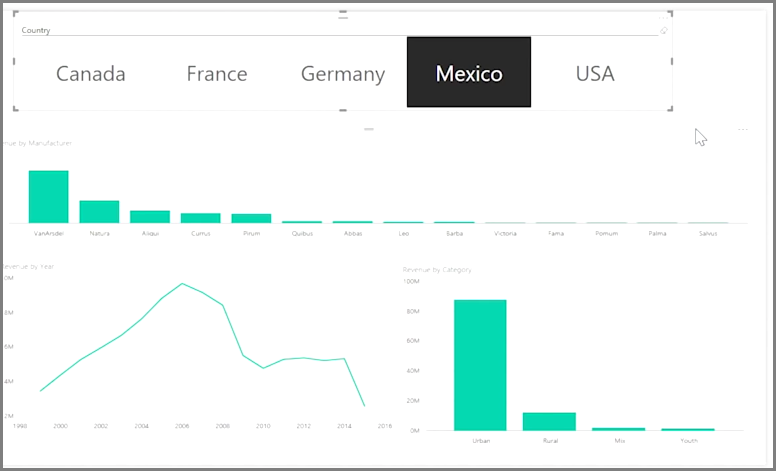 By doing this, Power BI allows your visuals to have time-based interaction with those viewing your reports, by letting users drill-down through those different time levels. With a hierarchy in place, you can begin drilling down through the time hierarchy. For example, clicking a year in the chart drills down to the next level in the hierarchy, in this case Quarters, which are then displayed in the visual. In that automatically created hierarchy, you can also manage to which level your shared report allows people to drill. To do this, in the Visualizations pane, simply click the X beside the hierarchy that you want to remove. The deleted level is removed from the report, and drilling no longer displays that level. If you need to get that level of the hierarchy back, just remove the date field, and then add it again from the Fields pane, and the hierarchy is once again created for you automatically. There may be times when you don't want the hierarchy to be used for a visual. You can control that by selecting the down-arrow button beside the Date field (once you've added it to a visual), and select Date rather than Date Hierarchy. That prompts Power BI to show the raw date values in the visual. You can also expand all data elements currently visible at once, rather than selecting a single quarter, or a single year. To do that, select the Drill all icon in the top left of the visual, which is a double-down arrow icon. 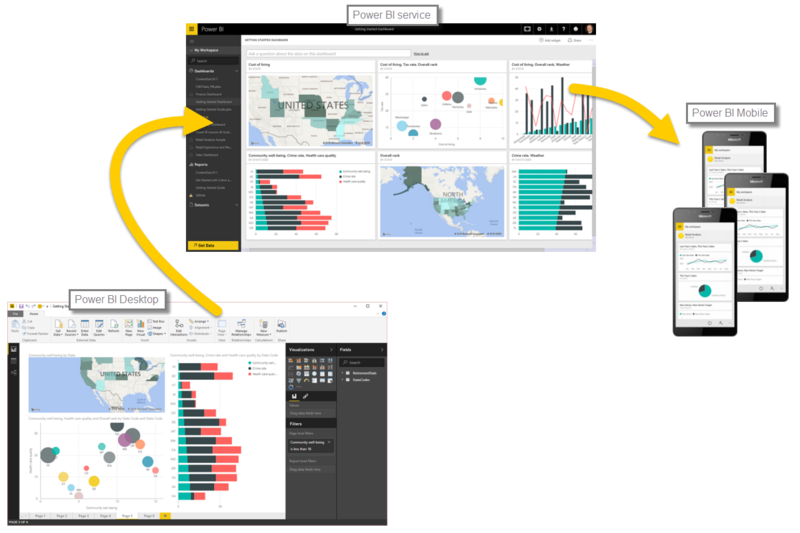 With Power BI Desktop, you can perform analytical and statistical analysis and create compelling visuals by integrating with R. You can host those R visualizations within the Power BI Desktop report. 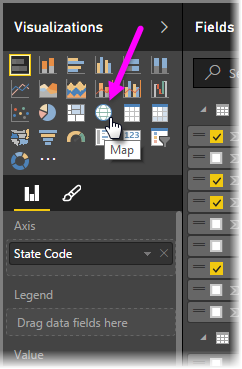 When you select the R visual icon from the Visualizations pane, Power BI creates a placeholder on the canvas to host your R visual, and then presents an R script editor for you to use right on the canvas. 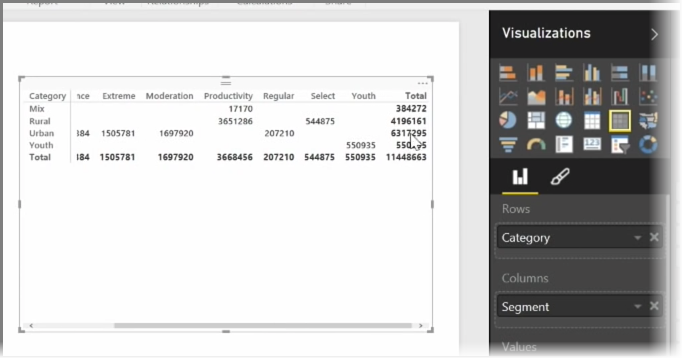 As you add fields to the R visual, Power BI Desktop adds them to the R script editor pane. It all happens quite quickly, and the result appears in the R visual visualization on the canvas. You can change the R visual by adjusting the R script, and then selecting Run again. In the following image, we changed the visual to display circles instead of squares. 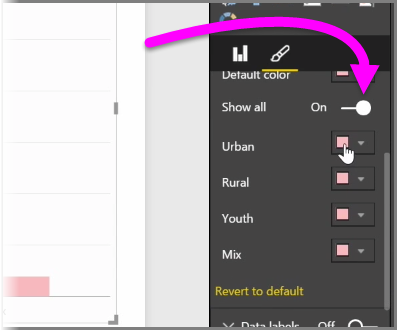 And since the R visual is just like any other visual in Power BI Desktop, you can interact with it and make connections with other visuals on the canvas as well. 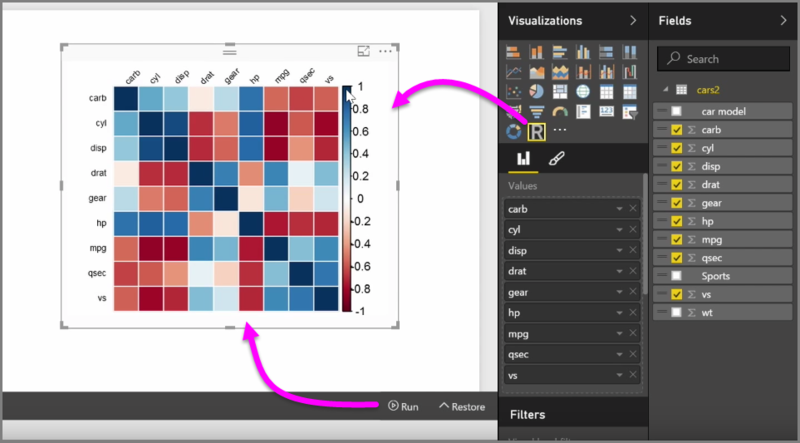 When you interact with other visuals on the canvas, through filtering or highlighting, the R visual automatically reacts just like any other Power BI visual, without needing to adjust the R script. 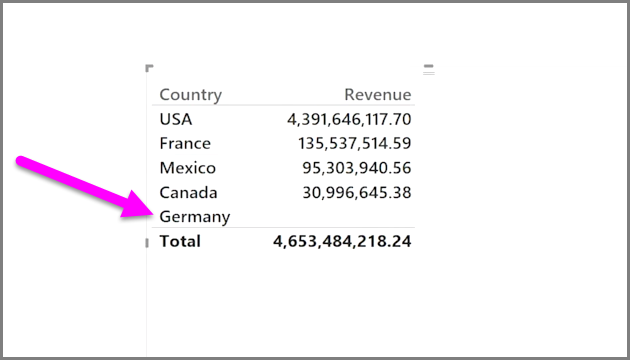 It's a great way to use the power of R, right in Power BI Desktop. Congratulations! 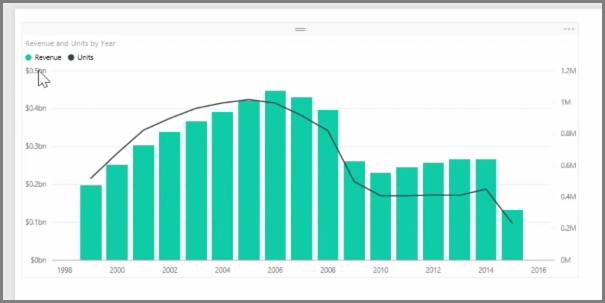 You've completed this Visualizations section of the Guided Learning course for Power BI. You can consider yourself well-versed in the many visualizations offered in Power BI, and also knowledgeable about how to use, modify, and customize them. 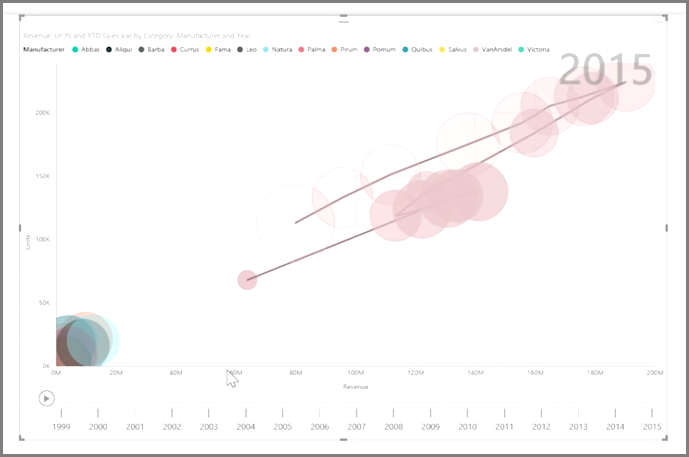 And good news: visualizations are essentially the same in Power BI Desktop and the Power BI service, so what you learned applies to both. Whether you create reports or just view and interact with them, you now know how all those cool visuals are created, and how they connected to the data. Next we get to see those visuals and reports in action. Nice work. You've completed the Visualizations section of Guided Learning, and you're ready for the next tutorial - Exploring data.